I’ve been working on a research project for the past few weeks regarding the pitching of bloggers. I’m reaching out to thousands of bloggers on behalf of the MatchPoint application for PR pros to gauge their interest in receiving pitches, news, notes, and social media news releases from MatchPoint’s clients. The team that developed MatchPoint decided (thankfully!) to make it an Opt-In service and ask bloggers’ permission to provide the bloggers’ email addresses to MatchPoint’s clients. Many bloggers have been rightfully outing PR people for spamming when they use old school databases that mass-blast PR Spam from their media lists. I think that last point is most significant. There are many bloggers who have a huge appetite for your news content! It’s notable that this is not an obscure group of bloggers; all were in the top 100,000 blogs by traffic. 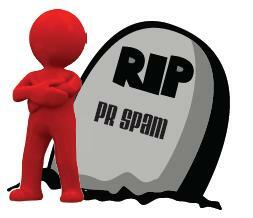 Most likely, that last group of bloggers is not in most PR Spam databases. So go get ’em! Just be sure you know each blogger’s preferred method of receiving pitches whether it’s email, via their blog, DM, or carrier pigeon. Also make sure your content is relevant to what they typically write. Posted on November 20, 2009 July 31, 2012 by Jack MonsonPosted in Digital Marketing and Social MediaTagged blogger relations, media relations, pitching, pitching bloggers, pr matchpoint, PR Spam, PR Tips, pr tools, public relations. Interesting post. Also, interestingly I found your pitch for Matchpoint in an unsolicited email this morning. I can see both sides of this issue. On the one hand are public relations outlets representing clients who want and need to have their news spread “out there” and spread to bloggers is one of the many landing places. On the other hand are bloggers who – for the most part – don’t see their blogs as “newspapers.” At least I don’t. Having said that, there is yet another side to that hand; I have received some pitches, rather requests, for me to write about something that the requester obviously took pains to make sure was relevant to my blog. It’s rather easy to tell if someone has read your blog judging by the pitch in the email. This is an interesting process. Linda, thanks for your comment! My pitch to you as a blogger is my way of asking your permission for MatchPoint’s clients to send you emails. It is an sticky situation and process; for many bloggers, there’s not a good way to ask their permission to send emails without first sending an email. It’s kind of like riding a motorcycle without a helmet on your way to buying a helmet. But, I’m still glad the development team decided to ask bloggers’ permission first. SO – what’s your preference? No email at all or email if it is relevant to your blog? Love to hear your feedback!